A comprehensive guide to every comic book series in Marvel Comics’ 2018 Fresh Start era. Part of Crushing Krisis’s Crushing Comics. Updated May 2018. What is Marvel’s Fresh Start? Marvel Fresh Start represents an era of Marvel’s comic line that began officially with Avengers (2018) #1 in May 2018, but also informally includes several series launches in the months leading up to that kickoff. Titles did not carry an explicit “Fresh Start” banner or trade dress, so for some titles the beginning of Fresh start is approximate. In continuity, Fresh Start does not coincide with the end of a specific event or an inciting incident. There are a few specific story beats that precede it, including (roughly in order) the resurrection of Las Vegas in Doctor Strange: Damnation, the return of Hulk in Avengers: No Surrender, the return of Tony Stark at the end of Invincible Iron Man, and the death of Mighty Thor (which is chronologically the final plot beat of Marvel Legacy, since Thor appears in many of those other stories). 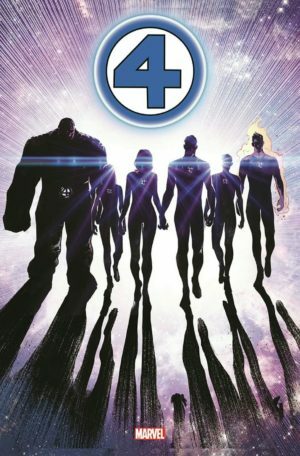 Marvel Fresh Start isn’t associated with any specific new storyline, but it mirrors DC Rebirth in that it returns the focus to a recognizable core of Marvel heroes and titles that have mostly been well-known for decades with a few exceptions. At the time of this writing, we’re still very early in Marvel Fresh Start with only a handful of titles released and three months of future titles solicited. It usually takes between six months and a year of solicitations for the true scope of a Marvel era to become evident. That could include realizing that some series fit entirely into the prior era, that runs have different breaking points that I’ve chosen here, or that entire lines of titles should be differently grouped. 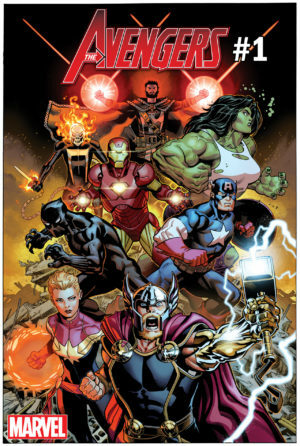 Jason Aaron’s relaunched Avengers team includes the core members Captain America, Iron Man, Thor, Captain Marvel, and Black Panther, so all of their ongoing titles are grouped here as part of the Avengers line. Doctor Strange may be a temporary member, based on initial marketing. Continues from: The last preceding story was Avengers “No Surrender,” but as with the start of Avengers in Now and ANAD Marvel, this does not require any foreknowledge to step into. It also connects to scenes from Aaron’s Marvel Legacy #1. The cast includes a core of Captain America, Iron Man, Thor, Captain Marvel, Black Panther, and She-Hulk, with other heroes rotating in and out of the team – including Doctor Strange and Ghost Rider (Robbie Reyes). Continues from: Black Panther (2017) #172 ended “Season 2” of Coates’s run. This also draws from Black Panther scenes in Marvel Legacy #1 (and also hints as far back as Hickman’s New Avengers #1) in that it launches “The Intergalactic Empire of Wakanda.” This comic opens with Black Panther on a deep space mission to avert the conquering ways of Wakanda’s long-lost colony. Continues from: Doctor Strange (2017) #390 (and Damnation, just before that). Issue #390 was a sort of continuity reset for Strange after his ANAD Marvel adventures – the world is full of magic again, Las Vegas is no longer destroyed, he is back on Bleeker Street as the sorcerer supreme, and his sidekick slash romantic interest is written out of the book. Like Black Panther, Strange is also taking to space in his new book – in his case, to connect to a different kind of magic. Continues from: This is an origin story that does not continue directly from the prior volume. In present-day continuity, Captain Marvel is appearing in Infinity Wars. Continues from: The Avengers “No Surrender” storyline that ended Marvel Legacy. This series literally takes place in a moment in time for Quicksilver, though it’s a moment that all of his teammates assumed lead to his death! Where did he disappear to? This limited series tells the tale. Continues from: The Mighty Thor (2017) #706 and the Mighty Thor: At the Gates of Valhalla (2018) one-shot resolve the story of the female Thor and brought Odinson back to the center of the Thor story. This run finds Odinson back in the starring role as Makelith continues his campaign to rule all ten realms, but it’s not beginning as a direct continuation of the Makelith story. Instead, it begins with Thor chasing down mystical artifacts of Asgard which have been scattered Ecross earth. Continues from: Tony Stark’s return in Invincible Iron Man (2017) #600. Riri Williams continues to star in Champions. A freshly-scarred Doctor Doom has yet to turn up as of this writing, but may wind up in Fantastic Four. Continues from: This three-part Dora Milaje story likely begins sometime after Black Panther #172 and will likely give us a view of what is going on for Wakanda on Earth while T’Challa is amongst the stars. Continues from: Hawkeye (2017) #16 for Kate Bishop, “Avengers: No Surrender” for Clint Barton, The Unbelievable Gwenpool (2016) #25 for Gwenpool, and Generation X (2017) #87 for Quentin Quire. This pitch finds the youthful team in something like a mockumentary setting. Continues from: Amazing Spider-Man (2017) #801, the final issue of Dan Slott’s run. 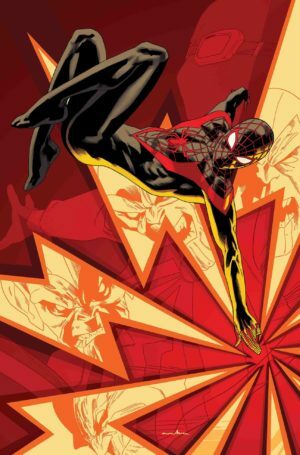 Spencer will be starting from scratch with a relatively blank slate, as Slott broke down many of his plots to leave Peter Parker back in a recognizable underdog situation. Continues from: Issue #18, which was the end of the previous arc. Continues from: Issue #20, which was the final issue of the Volume 4 collected edition. This run continues Ben’s quest to find Kaine. Continues from: This anthology series is the prequel to a late-2018 Spider-Event. Continues from: Issue #307, which was solicited as “the end of year one” of this title. This new run begins with a Sandman story. Continues from: Spider-Man (2017) #240, which was the end of Brian Bendis’s run on Miles Morales. Miles also appears in Champions. Continues from: The most-recent collected edition of this title is solicited to include issues #34-39. Until we see those issues (and if an issue #40 is solicited), we don’t know what the beginning of Fresh Start will be. Continues from: Venom (2017) #165 and Venomized (2018) #1-5. This new run explores the revelations that Venom wasn’t the first alien symbiote to land on Earth. Continues from: This is a flashback story that expands on information in Venom (2018) #1. All of the X-Men team titles continue into Fresh Start without an announced renumbering, although we are getting new series for Domino, X-23, and Wolverine. Continues from: Astonishing X-Men #12, although this is a completely new team and story from the Charles Soule arc of the first twelve issues. The initial line-up includes Beast, Dazzler, Colossus, Havok, and Warpath. Can the team trust Havok after he spent years with his personality reversed due to Axis? And what do a reformed Reavers want? Continues from: This appears to continue from Despicable Deadpool #300, though not directly. Continues from: Dazzler has not appeared regularly in a Marvel Legacy X-Men title. In fact, this was originally solicited as “Dazzler #43” in Marvel Legacy as one of their one-shot continuations of classic series. Now, this likely ties in to (or, at least, promotes) her return in Astonishing X-Men. Continues from: None of this team have appeared recently in other comics – Blink, an old version of Kamala Khan, a movie-esque version of Valkyrie, a cartoonish Wolverine, and more. Continues from: This is the pivotal end-game for the time-displaced original X-Men team, though it’s not yet clear what issue of X-Men Blue it will continue from – some point after the resolution of Venomized. This event begins in a Hunt For Wolverine One-Shot before splitting into four concurrent four-issue mini-series – Adamantium Agenda (by Tom Taylor and R.B. Silva), Claws of a Killer (by Mariko Tamaki and Butch Guice), Mystery in Madripoor (by Jim Zub and Thony Silas), and Weapon Lost (by Charles Soule and Matteo Buffagni) before resolving in Hunt For Wolverine: Dead Ends One-Shot. Continues from: Multiple Man was last seen (briefly) in Death of X, and this series follows up on where we left Jamie Madrox – presumed dead! Continues from: Old Man Logan (2015) #40. This series continues at least through #46 in August of 2018, which is the final issue of the currently-solicited Volume 9. If that proves to be the final issue, I’ll move this entry back to Legacy. Continues from: Issue #21 is the final issue before a new team is introduced, as lead by Sabretooth. If this runs only one arc into Fresh Start I will move this entry back to Legacy. Continues from: Various “Hunt for Wolverine” series, above. Continues from: All-New Wolverine (2016) #35, although Laura also ostensibly appears in X-Men Red #1-5 and some of “Hunt for Wolverine” prior to this series. Continues from: TBA. Marvel says we’ll learn more about this title in June 2018. Continues from: Both X-Men Blue (2017) #28 and Venomized (2018) #5. With the young X-Men cast seemingly beginning their return home (or other removal) in Extermination, this title will be anchored by Magneto and Polaris, along with their team of mutants including Bloodstorm (Storm from Mutant X), Jimmy Hudson (Wolverine’s son from Ultimate Marvel), Daken, Briar Rose, Danger, and more. Continues from: X-Men Gold #30, the wedding issue. 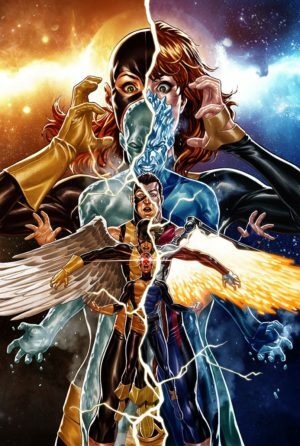 The core team in this title is lead by Kitty Pryde and includes Storm, Colossus, Nightcrawler, and Rachel Summers, with frequent additions including Rogue, Iceman, Ink, Armor, Magma, the new Pyro, and more! 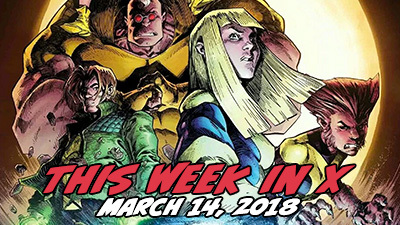 Continues from: While the first arc of X-Men Red began definitively in the Marvel Legacy period, it is mostly set three months in the future from its earliest events, which likely means we can read it as existing entirely within Fresh Start. In terms of publishing schedule, issue #6 begins the second arc of this title and lines up with other Fresh Start releases. The team is lead by Jean Grey and includes Nightcrawler, X-23, Honey Badger, Namor, and a new character named Trinary. Continues from: X-Men Grand Design (2018) #1-2. These are the middle chapters special series by Ed Piskor which streamlines all of the X-Men’s continuity from 1963 to 1991 into a single epic story. These issues cover from Giant Size X-Men to somewhere around Uncanny X-Men #175. Continues from: Nadia Pym as Wasp last appeared in Avengers “No Surrender” and continues to appear in Champions. Scott Lang as Ant-Man is currently starring in Infinity Countdown as a member of the Guardians of the Galaxy. Continues from: Thanos (2016) #18 & Annual 1. 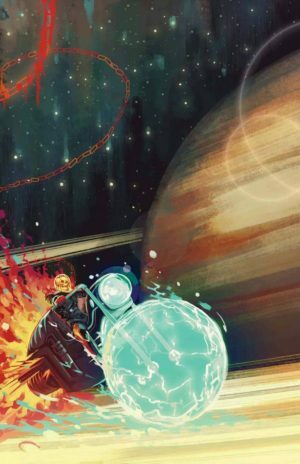 This comic seems to be extending Cosmic Ghost Rider’s story from where we last saw him. Continues from: While issue #601 is not explicitly part of Fresh Start, it’s the end of a lengthy arc and Ron Garney’s final issue on the title. Unless it turns out that this new run does not extend past one arc, it seems as though it will fit into Fresh Start. Continues from: Despicable Deadpool (2017) #300. Based on the end of that Gerry Duggan run, Deadpool is back to basics as a merc-for-hire in this run. Continues from: Despicable Deadpool (2017) #300. Continues from: The end of “No Surrender” in Avengers (2017) #690. In that story, we see Hulk cheat death once again, which leads Banner to realize his alter-ego is a different kind of monster – not just a monster made of rage, but one who is literally undead! Continues from: This title continues uninterrupted from Marvel Legacy; the Volume 5 collected edition ends with issue #30. 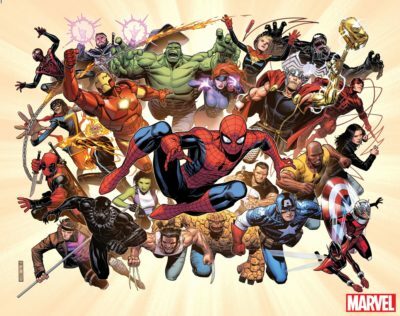 Continues from: It is not clear if this Marvel Legacy renumbered run will continue past issue #200, so we cannot yet say if this is a part of Fresh Start. Continues from: This title continues uninterrupted from Marvel Legacy; the first Fresh Start issue may be either #31 or #35. Continues from: This series set in the Old Man Logan future began during Marvel Legacy. Continues from: Punisher (2017) #228. Matthew Rosenberg is one of the few writers to be continuing his run on a character onto a new #1 in Fresh Start. It promises to take Frank Castle back to basics after he spent Marvel Legacy in the War Machine armor, but also that his time as super-powered anti-hero inspired him to think bigger when it comes to his targets. Continues from: Sentry last appeared in Doctor Strange #382-385, the final arc prior to Damnation. This series will explore his Superman/Clark Kenth dichotomy for the first time in the present day. Continues from: While issue #32 wasn’t explicitly part of the Fresh Start period, launch artist Erica Henderson’s final issue was #31. Continues from: Weapon H launched just ahead of Fresh Start, but for all intents is a Fresh Start series – since it has no obvious connections to Legacy continuity. Weapon H is a new character created from cloned DNA from the Weapon X team and the Hulk just prior to Marvel Legacy in the “Weapons of Mutant Destruction” story arc. He is on the run from the para-military for-profit corporation that spawned him. Continues from: Issue #18 is the final Mark Waid and Humbert Ramos issue, which makes #19 a clean place to pick up this title. It’s also a line-up change! The new line-up is Ms. Marvel (Kamala Khan), Hulk (Amadeus Cho), Nova (Sam Alexander), Miles Morales (Spider-Man), Viv (the daughter of Vision), Ironheart (Riri Williams), Wasp (Nadia Pym), Snowguard. Continues from: The two final Inhumans issues prior to this one were Inhumans: Judgment Day and Black Bolt #12. This appears to feature the full royal family and many of the supporting players invented in Charles Soule’s Inhumans, but it is unclear if it will also feature other Inhumans like Ms. Marvel and Moon Girl. Continues from: Marvel 2-in-One, though it is currently unclear where that series will end for this to begin. Continues from: This major summer event is effectively the Guardians of the Galaxy title to launch Fresh Start, as the entire team appears here – Star-Lord, Gamora, Drax, Rocket, Groot, and Nova. This event appears to be mostly self-contained in its own series, as opposed to lead-in Infinity Countdown, which spawned several tie-ins. Continues from: A second arc of Runaways ends with issue #12 with no #13 solicited as of this writing. If the series continues, #13 should mark the beginning of Fresh Start. This version of Runaways stars all of the major characters associated with the team Karolina Dean, Molly Hayes, Victor Mancha, Nico Minoru, Chase Stein, and Gertrude Yorkes.